Computers and technology in all its glory but today I am going to write about my most geeky interest. This is the one of my interests I usually don’t talk about so I think a lot of my friends don’t know about it. It is also my oldest interest because it all started the day I was born. So, 26th of June 1982 I was born at the old hospital in Norrköping. My aunt was working at the maternity ward at the time so she came to visit me and my mother. With her she had brought a Steiff Teddy Bear. And for you who don’t know about Steiff, Margarete Steiff was the woman who made the first teddy bear in the world in 1902. 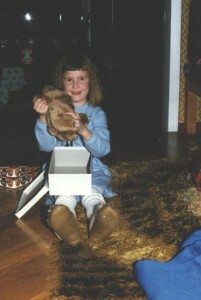 That little bear I got was my first reason for loving bears. To bad I have no digital picture of that bear but nowadays he has a broken arm and he is blind in one eye. 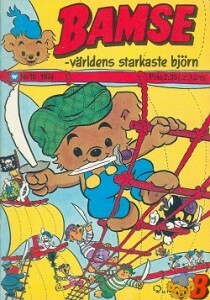 In 1986 I started to read my first issues of Bamse. Bamse is a comic for kids about the strongest bear in the world. 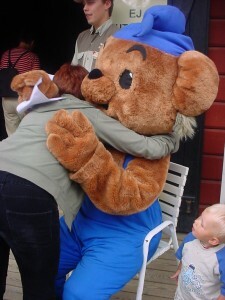 And ever since I am stuck with Bamse. I just love that little bear and all his adventures. He has beaten Winnie the Pooh by far in my opinion. Me giving Bamse a birthday hug on his 30th birthday, 2003. 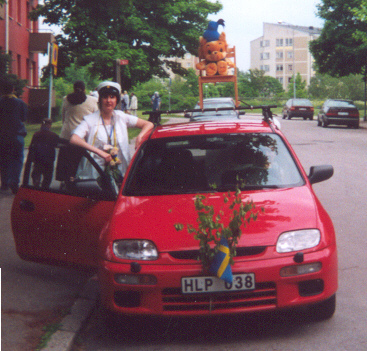 When I graduated from High school I got a big Bamse teddy bear who got to sit on the top of the car roof on the way home. On Christmas Eve 1987, I got the teddy bear I’ve worn and loved the most and I don’t think you need to guess about the name I gave him. Today, only about 70% of his fur remains on the body. In 1995 I decided that I would collect all the issues of Bamse. Said and done, I took my bike and went to second hand shops, flea markets and so on to find as many issues as possible. I also made tables in Excel of my collection and handed out to my family members so they knew which ones I missed if they would happen to run across an issue or two. When I got Internet at home a new market opened up for me and it was now even possible to search for issues of Bamse all over Sweden. Although it turned out that I wasn’t alone about this interest. When the Internet became mainstream the awareness of the value of Bamse issues came and suddenly it was expensive to collect Bamse. Although I have managed pretty good I think. At the moment I have all the issues of Bamse that has been released except from three issues, one from 1973 and two from 1974. And the most expensive one of them was 10/74. I paid 750 SEK for it, which actually is cheap since it is a very difficult issue to obtain. But if you read this and have anyone of the issues 1/73, 3/74 or 8/74, I am interested in buying them, and I pay well! So, now I have revealed my most geeky interest in the blog and now everyone knows how crazy I am. Some people say it’s a sign of being healthy but you are free to judge me however you want to. My most expensive issue of Bamse 10/1974.